Beautiful lighting is an important element in the decor of the room. Quickly refresh an interior without significant financial investment, it is possible by making a new lampshade for the lamp. He will contribute a special flavor to your living space. 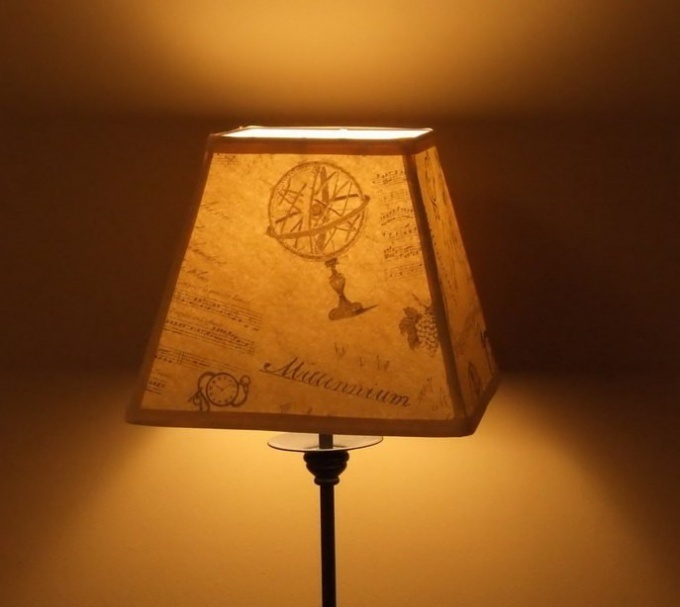 To create this lampshade for a table lamp you will need the frame from the old. You can decorate as a metal base, and smooth plastic. Wrap the frame of a large newspaper sheet and samnite it at the top and bottom. Remove the sheet and cut out a detail. Try it again and adjust the size. Fabric for decor match with the requirements for illumination of a room. If you need bright light use a cloth more thin and transparent, and twilight suitable dense material. Attach the newspaper pattern and make the blank out of the fabric taking into account the allowances. Original will look at this corrugated fabric shade. It will give a light volume due to the effect of bunching. Wrap the frame of the prepared tissue, stretch and fasten it by bending in the opposite direction. On a metal frame material can be sewn with thread, and the plastic is just glued with hot glue. On the paper pattern to make more detail of the guipure. Secure it on top of a lampshade covered with cloth. If you have the desire, the lace detail a little bit longer than the pattern, then it will be nice to drape on the lampshade. Original and transparent to light shade can be done using stocks beads and beading. Made of aluminum with wire frame for lamp or use the original. Paint with acrylic paint and brush or spray the Foundation in the appropriate color. It will be visible through the decorative elements. If you want to make an interesting texture for the metal frame, wrap each wire separately with toilet paper, periodically soaking it in the PVA glue. When the glue is dry, paint with acrylic paints the basis for a lampshade. On a long piece of twine string different sized beads, punctuated by them with beads. You should get a long string. On both sides, leave the ends of the fishing line to be fixed on a metal frame. For such decoration of the lampshade, you can use ready-made thread, beads, jute rope, narrow strips or braid. Tie one end of fishing line to the top circle of the shade. Wrap the entire structure through the top and bottom circles. The winding density adjust in its sole discretion. To complement the decor of the shade can be attached at the bottom edge of the frame-shaped suspension. Just thread through a hole in a piece of fishing line and tie them to a metal circle. Cut the protruding edge of the line and oplate them not to dissolve the thread and separate jewelry.